"It’s designed for travel, with clips that hold the lid on, and a gasket for a tight seal." 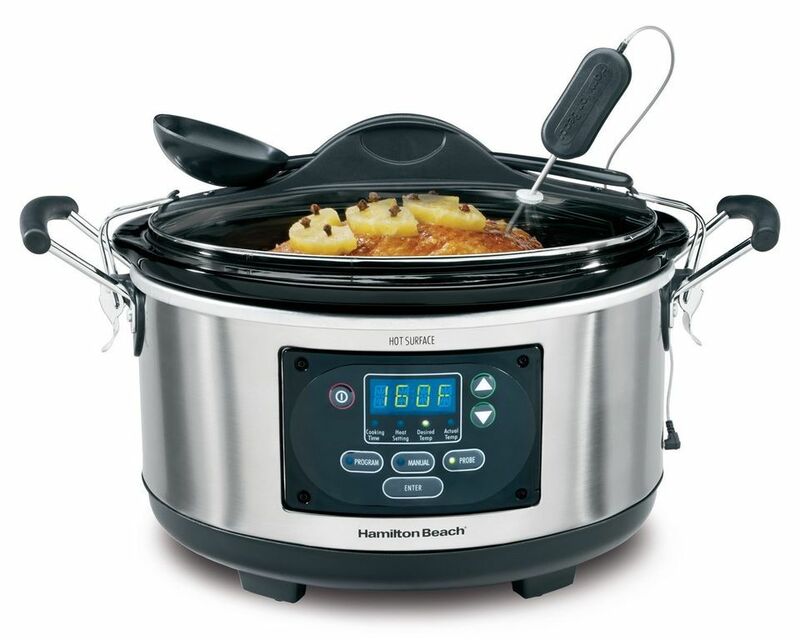 Not only does this slow cooker have the basic functions, it also has a few special features that you won’t find in other slow cookers, like the temperature probe than can be used to check the temperature of a roast while it cooks. This is a programmable slow cooker with a keep-warm setting, but you can also opt to ignore the programming and use it manually. The oval shape of this 6-quart cooker means there’s plenty of room for a roast or large chicken. It’s designed for travel, with clips that hold the lid on, and a gasket for a tight seal. Sturdy handles make it easy to carry. It also includes a spoon that clips to the cooker, so it’s handy for serving. There are three settings: program (which allows you to set a cooking time) probe (which uses the temperature probe to determine doneness) and manual (which lets you set high, low, or warm temperatures without setting a cooking time). Interested in reading more reviews? Take a look at our selection of the best slow cookers. This cooker has a polished stainless steel exterior that looks pretty enough to sit on a buffet table to serve warm foods. It holds 6½ quarts, which is plenty for large roasts and whole chickens, and it has a timer that will run for up to 26 hours. It has a black ceramic insert that can be removed for serving or cleaning, and a glass lid so you can see what’s cooking. The digital display is easy to read, and it has sturdy stainless steel handles for carrying the cooker. If you don’t need all the options that come with high-end cookers, this model can handle your basic slow cooking needs and is great for smaller families, since it’s just four quarts. There are no timers and no programming modes, just a simple dial that can be set to low, high, warm, or off. The oval stoneware insert is removable for serving or cleaning, and it has a glass lid. This comes in black, red, or silver, and there is a similar 7-quart model, if you want or need a larger size. Instant Pot is one of the most popular electric pressure cooker brands on the market, and this 6-quart model is one of their best sellers. It has buttons for multiple functions: pressure cooker, slow cooker, rice cooker, sauté/browning, yogurt maker, steamer, and warmer. It can cook at high or low pressure, and has three sauté temperatures for versatility. The cooking insert is stainless steel, so it’s dishwasher safe, but not nonstick. The included rack can be used for steaming or for easy removal of larger foods from the cooking insert. The automatic keep-warm feature can hold cooked food at a safe temperature for up to 10 hours, and the manual keep-warm feature can hold food for almost 100 hours. If you want to start the cooking at a later time, you can set a delayed start for up to 24 hours. This model is also available in 5- and 8-quart models. Interested in reading more reviews? Take a look at our selection of the best pressure cookers. If you regularly cook larger amount of food, this 12-quart pressure cooker holds much more than other models. If you want to delay the start of cooking, you can set it to start cooking up to 24 hours later, and it will resume cooking in the event of a power loss. There are 13 cooking modes: meat, poultry, soup, steam, sauté, slow cook, dessert, beans, porridge, rice, timer, preset time, and warm. If this is a too large, the same model also comes in 4-, 6-, 8-, and 10-quart sizes. If you’re looking for a small pressure cooker for a small family, single person, or a dorm room, this little 3-quart electric pressure cooker can do almost anything its big brothers can, but in smaller quantities and with a smaller footprint. It functions as a pressure cooker, slow cooker, rice cooker, steamer, warmer, and stock pot. It can also sauté foods, and it has a yogurt setting. The cooking time is adjustable, but pressure cannot be adjusted. The cooking pot has a nonstick surface for easy cleaning and the cooker has multiple safety mechanisms, so you don’t need to worry about accidentally opening it while it’s still under pressure. This comes with a cookbook, a soup spoon, a rice spoon, a measuring cup, an extra sealing ring, and a steaming rack.